The doctrine of the Godhead is developed in several Book of Mormon passages. Some of these scriptures simply confirm what is taught about the Godhead in the Bible and other modern revelations. Other passages, however, offer unique and unparalleled insights concerning this foundational doctrine. The Book of Mormon consistently affirms the unity and oneness of the Godhead. For instance, in 3 Nephi 11 Jesus taught “that the Father, and the Son, and the Holy Ghost are one; and I am in the Father, and the Father in me, and the Father and I are one” (v. 27). At the same time, other passages emphasize that although unified in purpose, each member of the Godhead is distinctly separate and unique, bearing record each one of the others. The Book of Mormon teaches that God “knoweth all things, and there is not anything save he knows it” (2 Nephi 9:20). It shows that God has all power and that His servants can accomplish anything He commands (see 1 Nephi 17:50). It demonstrates that God is a “perfect” being (3 Nephi 12:48). It affirms that God is “not a partial God, neither a changeable being; but he is unchangeable from all eternity to all eternity” (Moroni 8:18). And it emphasizes that God’s love “is the most desirable above all things” (1 Nephi 11:22). While the essence of these teachings can be found in other scriptures, their specific phrasing and context in the Book of Mormon provide valuable additional insights. As an example of one of its most unique teachings about the Godhead, the Book of Mormon clarifies the nature of Christ’s pre-mortal identity. In Ether 3:16, Christ showed Himself to the brother of Jared and explained, “Behold, this body, which ye now behold, is the body of my spirit; and man have I created after the body of my spirit; and even as I appear unto thee to be in the spirit will I appear unto my people in the flesh.” From this detailed description, it becomes clear that mankind was patterned after the spirit body of the pre-mortal Jehovah. It also clarifies that Jehovah held not only the same identity, but was also similar in form or image with the mortal and resurrected Jesus Christ. The Book of Mormon provides even further insight into the character and personality of the resurrected Jesus Christ. In 3 Nephi, Jesus spent a considerable amount of time teaching, blessing, and praying for the people. Christ’s ministry among the Nephites provides an unparalleled glimpse of what it was like for a community to repeatedly and directly interact with a physically resurrected member of the Godhead. Also of importance are the Book of Mormon’s unique teachings about the Holy Ghost. For instance, when Nephi saw the vision of the Tree of Life, he was guided by the “Spirit of the Lord.” Yet despite His being a personage of Spirit, Nephi “beheld that he was in the form of a man … and he spake unto me as a man speaketh with another” (1 Nephi 11:11). 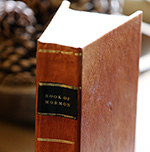 The prophet Joseph Smith taught, “It is the first principle of the gospel to know for a certainty the character of God.” He also testified concerning the Book of Mormon that its readers would “get nearer to God by abiding by its precepts, than by any other book” (Book of Mormon Introduction). 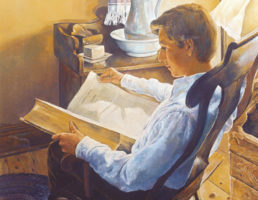 As Joseph Smith’s own life demonstrates, coming to personally know what God is like can be facilitated by reading the scriptures and then seeking for personal revelation with real intent (see Joseph Smith—History 1:11–13). One of the primary messages of the Book of Mormon is to invite all of God’s children to similarly come to know God personally. Elder David A. Bednar taught, “A grand objective of mortality is not merely learning about the Only Begotten of the Father but also striving to know Him.” Thus Moroni, in the concluding chapter of the Book of Mormon, twice repeated the injunction for his readers to “come unto Christ” (Moroni 10:30, 32). The Book of Mormon beautifully portrays the truth of Christ’s universal outreach in its account of His ministry among the Nephites. When Christ appeared to the people at Bountiful, he declared “come forth unto me, that ye may thrust your hands into my side, and also that ye may feel the prints of the nails in my hands and in my feet, that ye may know that I am the God of Israel” (3 Nephi 11:14, emphasis added). Mormon then recorded that “this they did do, going forth one by one until they had all gone forth” (v. 15, emphasis added). The symbolic message of the Book of Mormon is that Jesus Christ is inviting all of God’s children, one by one, to be intimately familiar with Him. He wants them all to personally witness and comprehend the effects of His infinite Atonement in their own lives. By coming unto Christ and accepting the eternal benefits of His atoning powers, readers will also come to intimately know God the Father and to live daily under the sanctifying power and guiding influence of the Holy Ghost. Elder Jeffrey R. Holland taught, “We are to know these Divine Beings in every way we can. We are to love Them, draw near to Them, obey Them, and try to be like Them.” They themselves associate with and relate to each other in perfect harmony, providing a model for all of us to follow. We can learn much about the Godhead from reading the Book of Mormon, but only by truly following its precepts and coming unto Christ can we can we be unified in purpose with these three Divine Beings. Elder David A. Bednar, “‘If Ye Had Known Me,’” Ensign, November 2016, 102–105, online at lds.org. Elder Jeffrey R. Holland, “Knowing the Godhead,” Ensign, January 2016, 32–39, online at lds.org. Elder Jeffrey R. Holland, “The Only True God and Jesus Christ Whom He Hath Sent,” Ensign, November 2007, 40–42, online at lds.org. John W. Welch, “Jesus Christ in the Book of Mormon,” in Encyclopedia of Mormonism, 4 vols. ed. Daniel H. Ludlow, (New York, NY: Macmillan, 1992), 2:748–750. See Book of Mormon Central, “Why is 3 Nephi Important for Understanding the Godhead? (3 Nephi 19:23),” KnoWhy 213 (October 20, 2016); Book of Mormon Central, “How is Christ Both the Father and the Son? (Mosiah 15:2),” KnoWhy 92 (May 4, 2016); David L. Paulsen and Ari D. Bruening, “The Social Model of the Trinity in 3 Nephi,” in Third Nephi: An Incomparable Scripture, ed. Andrew C. Skinner and Gaye Strathearn (Salt Lake City and Provo, UT: Deseret Book and Neal A. Maxwell Institute for Religious Scholarship, 2012), 191–233; Ari B. Bruening and David L. Paulsen, “The Development of the Mormon Understanding of God: Early Mormon Modalism and Other Myths,” FARMS Review of Books 13, no. 2 (2001): 123–132; Joseph Fielding McConkie, “God the Father,” in Book of Mormon Reference Companion, ed. Dennis L. Largey (Salt Lake City, UT: Deseret Book, 2003), 298. 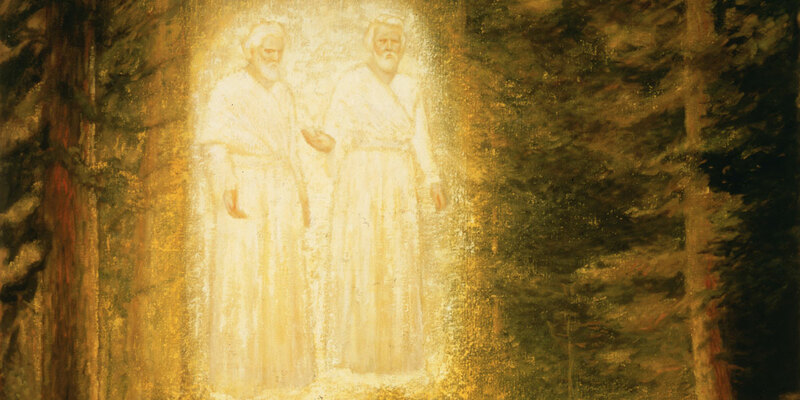 See Book of Mormon Central, “Why Is 3 Nephi Sometimes Called the ‘Fifth Gospel’? (3 Nephi 27:21),” KnoWhy 222 (November 2, 2016); Book of Moron Central, “Why Has 3 Nephi Been Called the Crown Jewel of the Book of Mormon? (3 Nephi 17:17),” KnoWhy 210 (October 17, 2016). Joseph Fielding McConkie and Robert L. Millet, Doctrinal Commentary on the Book of Mormon, 4 vols. (Salt Lake City, UT: Bookcraft, 1987), 1:77. McConkie and Millet further noted that Nephi’s account was supported by Joseph Smith’s teaching that “The Holy Ghost is a personage, and is in the form of a personage” (p. 1:77). Joseph Smith, Jr. “The King Follett Sermon,” Ensign, April 1971, online at lds.org. David A. Bednar, “‘If Ye Had Known Me,’” Ensign, November 2016, 103, online at lds.org. Elder Jeffrey R. Holland, “Knowing the Godhead,” Ensign, January 2016, 33, online at lds.org. The Book of Mormon's teachings about the Godhead is one of the "main" differences between what Latter-day Saints believe and what the Christian world has believed since the early man made creeds were written. The Book of Mormon and the appearance of both the Father and the Son to the boy Joseph Smith are critical is knowing the true nature of the Godhead.